Biodefense - What can you do to prepare? WHAT IS BIOTERRORISM AND WHAT ARE BIOTERROISM AGENTS? The Center for Disease Control and Prevention, or CDC, has defined: “A bioterrorism attack is the deliberate release of viruses, bacteria, mycotoxins, or other germs as agents used to cause illness or death in people, animals, or plants. Biological agents can be spread through the air, in our water, or in food. 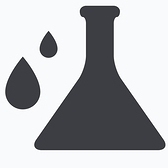 Terrorists use biological agents because they can be extremely difficult to detect and do not cause illness for several hours to several days.” Our national detection system to date remains very flawed. A major concern is the vulnerability of our water supplies throughout the nation, often protected only by a cyclone fence and a locked gate. Citizens of all cities and towns, large and small, should demand regular inspections and enhanced security at these vulnerable sites. We now test our water for toxins, bacteria, fungi and viruses but a biodefense plan also needs to be established to prevent bioterrorism acts before occurring in our water supplies. 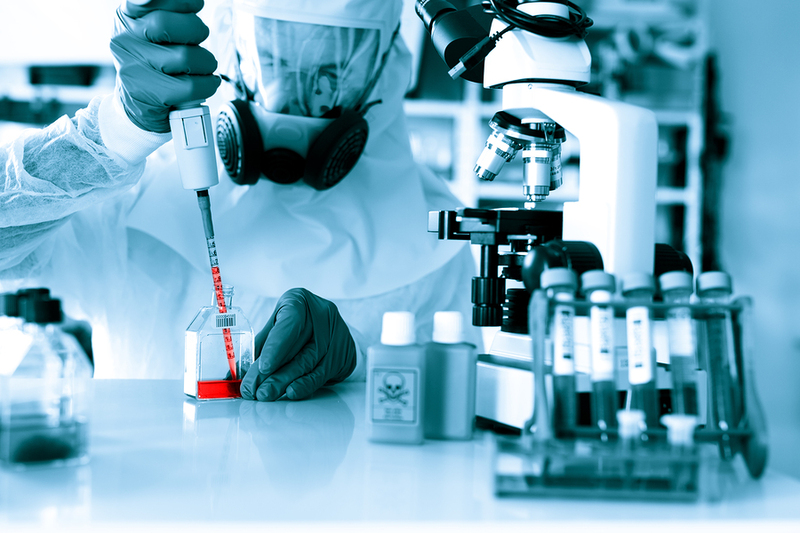 BIOTERRORISM RISKS – ARE YOU PREPARED? The chaos in the world due to terrorism is a scary situation for all of us. When the twin towers fell in 2001, memories were etched that are still incredibly vivid. With human loss of life over 2,000, the nation was in shock as terrorism declared war on and in America. With the rise of Isis the risk has significantly increased in the U.S. and worldwide. Fast forward with major terrorism events in Paris Belgium, plus U.S. events in California, military bases, Orlando and many other U.S. locations. While there have been no huge attacks using bioterrorism to date, there was Anthrax attached to U.S. mail in 2001. Small pox, anthrax, plague, eboli, radiation and many mycotoxins as fungal poisons threaten us while we have BioWatch, a national recognition system now flawed in operation according to the U.S. Government Accounting Office (GAO). While gas masks and hazmat suits offer protection, the general public does not have access nor the antidotes needed in most instances. A wise man once said, “if you’re looking for a helping hand, look on the end of your arm!” How? Keep your body and immune response in peak condition. God gave us 20 trillion cells in our immune response, or 1/5 of our entire body, to protect us from what seeks to harm us. If we ever needed protection it is now. The question of attack is not if, but when. We must be prepared with biodefense nationally, locally and personally. Be informed and be ready. Read additional Terrorism and Unexpected Event Preparation and Response information from the American Red Cross . George Washington began BioDefense in America. But are Vaccines becoming useless against GMO bioweapons; making boosting the immune system the best defense, as proposed by a prominent former bioweapons Soviet scientist? The deliberate manufacture by governments of deadly biological weapons containing diseases like smallpox and plague is nothing new. The beginning of “biodefense” in the United States involved General George Washington in the American Revolution attempting to protect his army from the threat of smallpox, or Variola, being used as a biological weapon. No vaccines existed at the time and thus a procedure described as variolation was performed on his soldiers which involved inoculation of the individual against smallpox with material taken from a patient in the hope that a mild, but protective infection would result, building up defensive antibodies against smallpox as the first threat of biological warfare in America. Rapidly, the threat of these agents being used as weapons of war in today’s world is escalating, says a former Soviet scientist, who told PBS’s Frontline that vaccines are no match for the advanced, genetically modified (GM) “bioweapons” that will most likely be used against civilian populations in the near future. During an interview, Dr. Kanatjan Alibekov explained the history of biological weapons procurement in Soviet Russia, of which he was Deputy Director from 1988 to 1992. 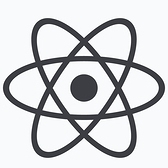 Having since committed himself to furthering American interests, Dr. Alibekov has apparently renounced his former Soviet ties and revealed what the Russian government, and presumably also the American government, has been up to on the biological weapons front. Though he claims that Russia’s biological weapons programs were shuttered back in the 1980s, Dr. Alibekov maintains that such programs could be up and running again in a matter of months. And with the advanced technologies that now exist, drugs and vaccines, he says, simply aren’t enough to provide adequate protection. Recognizing the inherent failure in relying on vaccines to provide some kind of ultimate protection against disease and possible biological weapons attack, Dr. Alibekov says governments need to focus on novel ways to boost natural, non-specific immunity. Our bodies are equipped, he points out, to naturally defend against disease, and more needs to be done to facilitate this activity. At the same time, vaccines come with possible risks and side effects. Since the number of individual agents used in biological weapons averages between 50 and 70, with some containing as many as 100, it would be logistically impossible to vaccinate against every single one of these, not to mention overtly dangerous. “If you vaccinate simultaneously against five, six, seven or ten diseases, [a] person could die just after such huge amount of vaccination,” warned Dr. Alibekov. The solution? Avoid focusing so much on vaccines and instead look for new ways to help the body do what it was inherently designed to do on its own: protect itself against disease. By targeting non-specific immunity through supplementation with “superfoods,” for example, entire populations can gain protection without the need for drugs or vaccines. This is true not only for hypothetical biological attacks in the future, but also for immediate threats such as Ebola, which can be avoided by taking certain precautionary and preparedness steps. The NSC IMMUNITION BioDefense Package is now offered at a giant 51% Discount at $99.95 for 3 protective nutritional products to keep the immune response normalized and ready to perform against what seeks to harm. Included are NSC IMMUNITION 100 Xtra Strength MG Glucan – 60 ct, as a biological defense modifier extensively medical school researched for more than 4 decades. Add the NSC IMMUNITION Respiratory Formula – 60 ct to keep useful air and sufficient oxygen available and essential to our bodies. When you are threatened with unwanted toxins and/or pathogens you want your body cleansed of the threats. 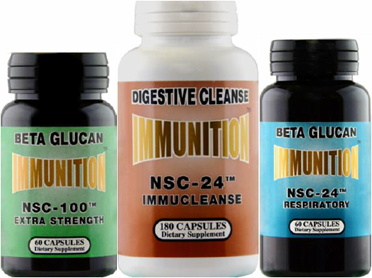 NSC ImmuCleanse is a potent multipurpose cleanse formula to help your body help itself. Working together these 3 NSC products bring to you the opportunity to possess and use the NSC BioDefense Package for the benefit of yourself and those you love. BEST BUY: To make this great NSC BioDefense Package more affordable at even below wholesale prices, Save $104.90 with Your 51% Discount from $204.85 retail value of the 3 Product BioDefense Package products and pay only $99.95! To Order click on “Buy Now.” To comment or seek more information, go to www.nsc24.com or Call 888-541-3997. For label and content detail, click on the individual product above and then on “Supplement Facts”. Choose Well – Choose Nutritional Protection – Choose the NSC BioDefense Package!